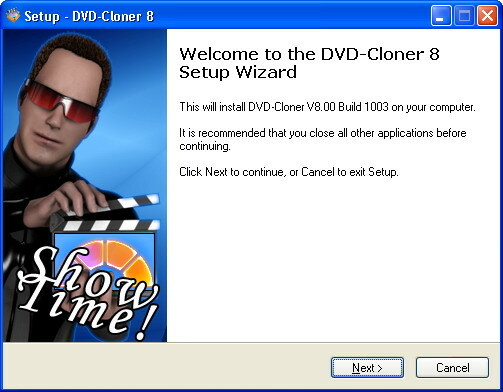 1 Install DVD-Cloner on a new windows XP system. The installation is quite simple following the Wizard. After the installation completes, a specific HELP document is provided. The disc we used was The Holiday (7.54G), SONY picture. SONY discs usually have a special way of protection, which many DVD copy software can not support well, or their copy time often lasts too long. However, the phenomenon above mentioned did not appear in our test. 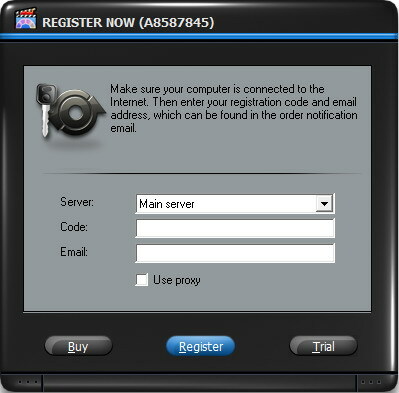 The interface is very easy to use, for the Express Mode is designed according to the usual manner. Just with a click on “Start” button users can backup their favorite DVDs. DVD-Cloner also provides Expert Mode for advanced users. There are various copy modes selectable, like Movie complete copy, Movie-only copy, Movie Split to two D5 discs, Movie Complete copy to a D9, Movie Customized copy, Full DVD disc copy,etc.there is Even include a function could combine two DVD discs into one DVD! In the expert mode, there are plenty of specific options available. The Movie Customized copy can realize partial preview and interception functions. In the Expert Mode, plenty of specific options are available. The first we tested was the most commonly used "Movie complete copy"function under the express interface. We used only one burner to convert and burn in the test. 26 minutes later, the converting completed. One thing need to be pointed out is that the CPU used was Pentium 4 1.8G and the Memory was only 512M. The converting finished in half an hour under such a low-configured system, which proves that the software is quite fast. Having finished the conversion, the DVD driver ejected automatically. 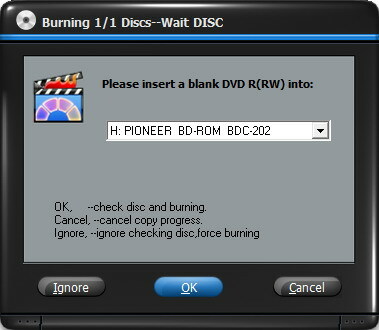 We inserted a cleared RW disc into the drive and it began to burn automatically. The burning process took about 13 minutes. And show the “completed!” windows at last. Finally, we played the copied disc with PowerDVD. It worked great. We really couldn't tell the difference between that and the original. 1. DVD-Cloner supports all kinds of discs well, even the SONY disc with poor compatibility. 4. The copied DVD plays as well as the original one.